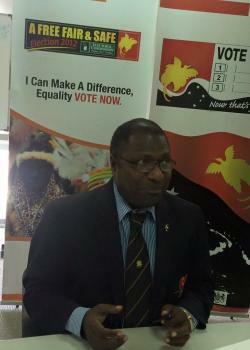 The National Election campaign period in Papua New Guinea will remain unchanged at eight weeks, says Electoral Commissioner Patilias Gamato. Gamato said he would not use his powers to reduce the campaign period which the Government wanted shortened by half to four weeks. The Electoral Commissioner said that dates for 2017 National Election remain unchanged except for the conduct of local level government election. Dates for LLG election would be changed after he has advised the Inter-Government Relations Minister Sir Leo Dion. “The important news is whether or not the campaign period will be reduced. As Electoral Commissioner, I have decided not to reduce the campaign period. “Campaign period will remain as eight weeks although the Government wanted reduction of four weeks. The law gives me the discretional powers to reduce or increase the campaign period, but I have decided not to and keep it at eight weeks minimum as stipulated by law,” Gamato said. “The reason for that is firstly, eight weeks will give enough time for PNG Electoral Commission to print and prepare the candidate posters for the election," he said. “Secondly, as stipulated under Section 79(1)(2) of the Organic Law on National and Local-level Governments Elections, the campaign period is eight weeks minimum and 11 weeks maximum, including the nomination period. The same provision also gives the Electoral Commissioner discretional powers to reduce or increase the campaign periods. “I have decided not to change the campaign period, therefore it will remain as initially approved by the Governor-General and announced by me,” Gamato said. *July 24: Return of writs. In summary, the National Election constitutes seven days nomination period, eight weeks campaign period, two weeks polling period, and two weeks counting period. The Electoral Commissioner also said he could not advise Inter-Government Relations Minister Sir Leo Dion to defer the local level government election. This was because the constitutional amendment to legislation to defer the LLG election to next year was still in Parliament for two more readings and required two-thirds majority vote to pass in April. Gamato said at the weekend that he was confident the deferral dates for the issue of LLG writs by 12 months after the return of the writs for the National Election would be approved by Parliament. “The LLG election might be deferred to about July 24, 2018, depending on the outcomes of the second and third readings in Parliament,” he said.